The NuMED Z-5™ Atrioseptostomy catheter is engineered for maximum steering and tracking. The dual lumen shaft design provides pushability, coupled with exceptional pull strength. This new innovation in Atrioseptostomy catheter design is of potential importance in patients who are subject to a small left atrium and in small neonates with congenital heart disease requiring Atrioseptostomy. The NuMED Z-5™ Atrioseptostomy catheter body is Radiopaque to facilitate reliable positioning of the catheter. A platinum image marker band is placed under the balloon for clear identification under fluoroscopy. The reduced inflated balloon size should make Atrioseptostomy easier to perform on neonates with a small left atrium. The tip of the catheter is angled at 35o to facilitate passage into the left atrium. 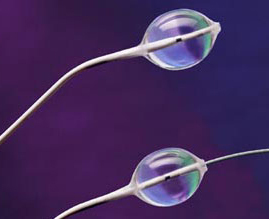 The NuMED Z-5™ Atrioseptostomy catheter has an inner lumen. The catheter end hole can accommodate a guidewire.